Oh noes! The clown from Spawn fused with Dr. Insano and Jinx from Teen Titan to become the ultimate alien-slaying super scientist, Dr. Evil!! It’s up to you to save the cute little Aliens by guiding them by finger to their rescue UFO that will beam them up and protect them!!! Created by MoStar, AlienPanic is available on the iPhone, iPod touch, and iPad for $0.99. AlienPanic, to my surprise, was a surprisingly enjoyable game app. You drag your finger from an alien to guide it along a path you draw. Draw the alien away from the crazy scientist Dr. Evil and try and get them into the UFO that is beaming up the aliens. If you don’t gather enough aliens, the UFO is destroyed (I’m assuming from lack of fuel or something), and if an alien is zapped by Dr. Evil, they vaporize unless another alien can come and revive them. The graphics are great. This is how you create grass textures. No ridiculous noise, no flat green areas, and it doesn’t look obviously tiled. The UFO and all the characters are created in 3D and look really good. Some aliens have low details and are rather ugly in terms of design, but the Evil doctor and the UFO itself are really well done. Then you have the comic book story that has excellently stylized feel to it. I really like the art in this app! The gameplay still could use some adjustments like in how fast the aliens move or how the recovery of the zapped aliens could have been handled. I would have actually preferred to tap rapidly on a zapped alien to revive him since they run so slowly as it is. When you have to guide 7-8 aliens at the same time into a single point while dodging Dr. 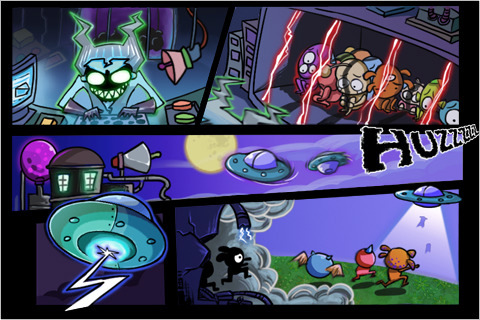 Evil and then you are expected to guide some aliens to save another, it gets too challenging. With some tweeks to the aliens’ run speed and a different revive function, I wouldn’t mind playing this game for hours upon hours. Try this one out, it’s only a buck! 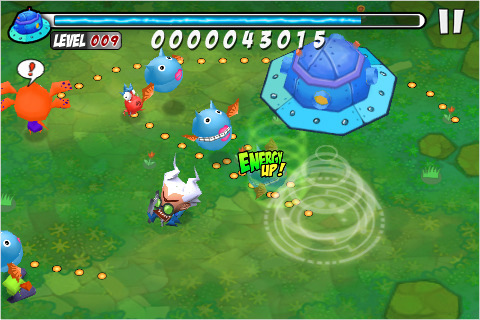 AppSafari review of AlienPanic was written by Joseph Ho on November 10th, 2010 and categorized under App Store, Games, Line Drawing, Resource Management, Strategy. Page viewed 3635 times, 2 so far today. Need help on using these apps? Please read the Help Page.